I’m glad the week is over. In addition to prepping our Chinese New Year foods and cleaning the house (because of superstitions), I managed to simultaneously come down with an infection which has left me feeling less than 100%. Next year, I just may allow myself greater leeway when it comes to purchasing rather than making all of the food from scratch. I also found this guide to be helpful on how to concentrate my energies when communicating with my elected representatives: Indivisible Guide: Former congressional staffers reveal best practices for making Congress listen. Now on to a happier topic… like huckleberries. Despite the fact that we are merely a month into winter, it already feels like spring to me with the ever-so-slightly longer days. 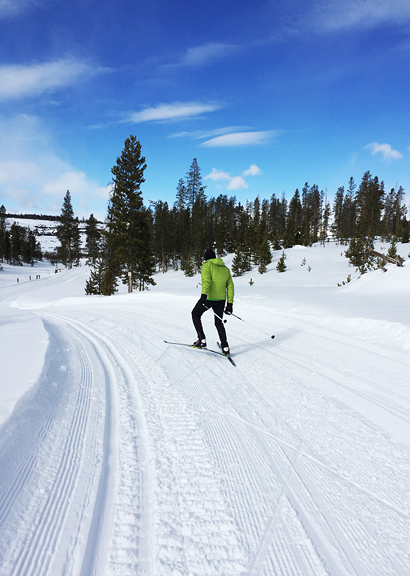 Of course, spring in our mountains amounts to generous helpings of snow and that signature Colorado sunshine. I won’t be replenishing my huckleberry stash until late summer (if I’m lucky! 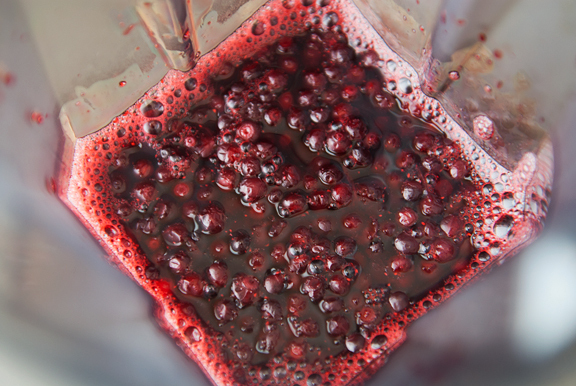 ), but it’s time to stop hoarding the precious berries in the freezer and start using some in recipes. I’ve made blueberry-pear pâte de fruit in the past, but always had the intention to try a huckleberry pâte de fruit. You can use fresh or frozen huckleberries here, and if you don’t have huckleberries, you can swap in blueberries. If you want to order frozen hucks, google around, there are a number of suppliers who sell them online from the Pacific Northwest. If you forage your own hucks, then you and I are kindred spirits. 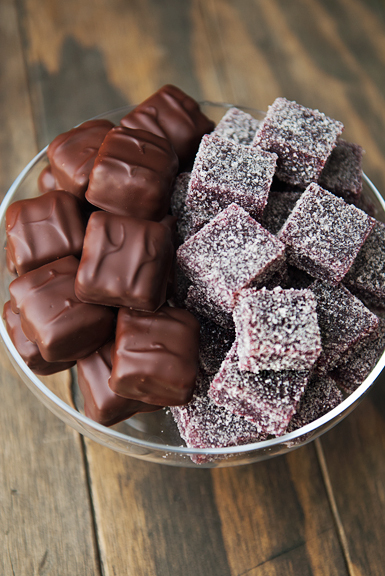 Pâte de fruit is a straightforward confection. Some involve fruit juice while others involve fruit purée. I personally prefer the purée because it has some of the fruit fiber which lends to a heftier bite. Also, I try to avoid discarding any part of my huckleberries because these berries involved a lot of backbreaking effort! There is applesauce added to the huckleberries, because I’m not sure how much natural pectin huckleberries contain. 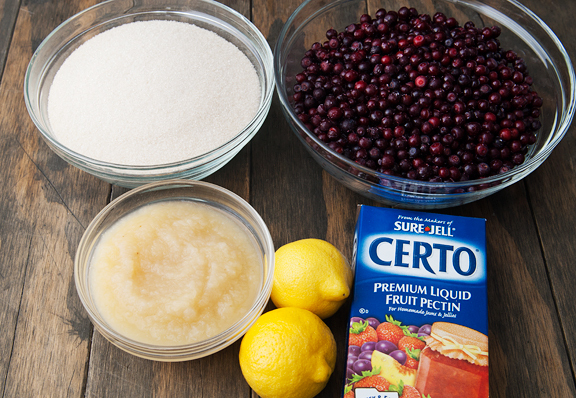 Plus, it helps to add some bulk without using up all of my precious berries. There are those people who never use a candy thermometer to make candy, and then there is me. I have tanked enough recipes at my elevation that a candy thermometer is a necessity so I can measure where I screwed up the recipe the first time. If you happen to live more than a thousand feet above sea level, you might consider using a thermometer for your candy-making endeavors. 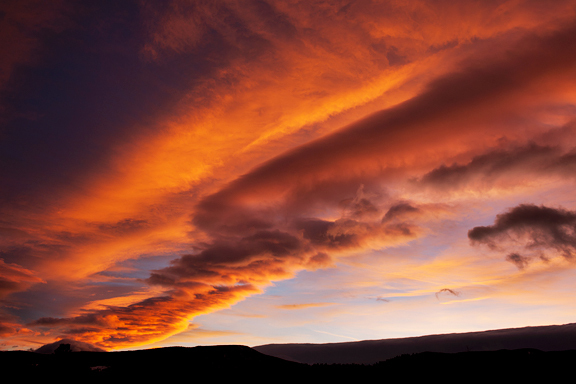 Water boils at a lower temperature the higher you go in the atmosphere because there is less (atmospheric) pressure. It is physics, it makes complete sense, and it will save you time, effort, money, and possibly tears. I tell you how to calculate the correction for your elevation in the recipe below. Once the jellies are set and cut, you can: 1) do nothing (but they stick to things), 2) roll them in sugar, or 3) enrobe them in chocolate. The first two options are very easy. The third option unnecessarily complicates your life, but the end result is worth the trouble. 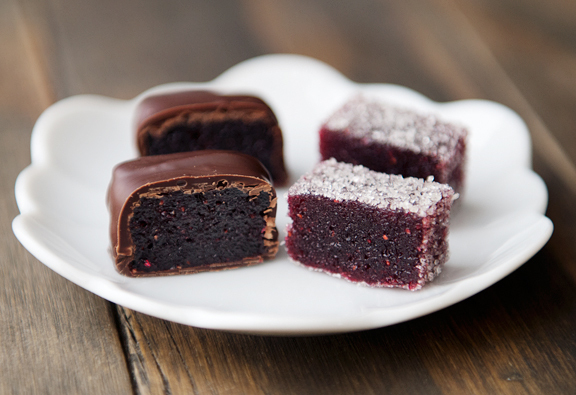 Because chocolate and I have a lukewarm relationship, I didn’t think it would pair well with my beloved huckleberry. But I was mistaken. It’s actually a crazy amazing combination of flavors. Tempered chocolate is the best way to enrobe the pâte de fruit, but that requires some careful technique and experience to get it right (of course, you’ll never get there if you don’t practice). If the shiny finish, delightful snap, and stability of the chocolate aren’t crucial, then you can do a straight melt-and-dip. Still delicious. 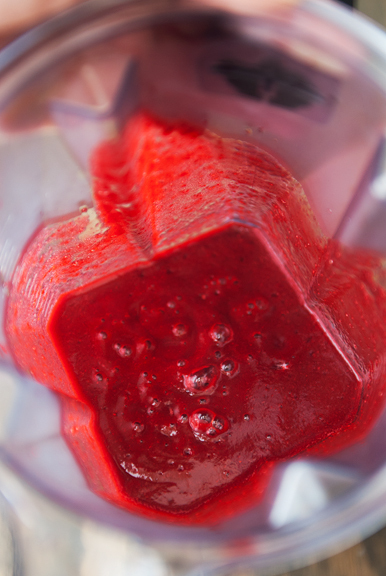 The concentration of the fruity flavor in each jelly is quite intense, so a little goes a long way. The sugar-rolled pâte de fruit is brighter, sweeter, and fruit-forward. The chocolate-dipped version is more luxurious, subtle, earthy. 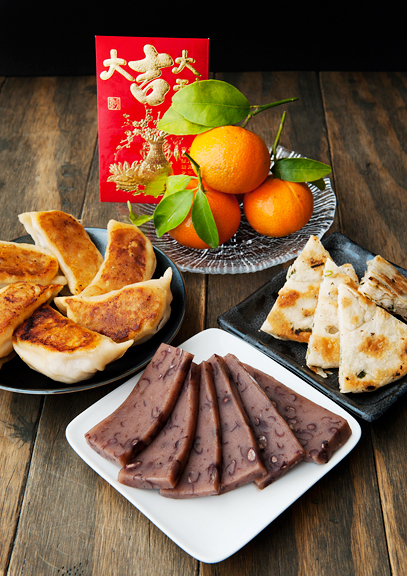 Both kinds make wonderful gifts, tea-time sweets, or after-dinner nibbles. Anyone who bites into one will know that these are really tiny squares of love. 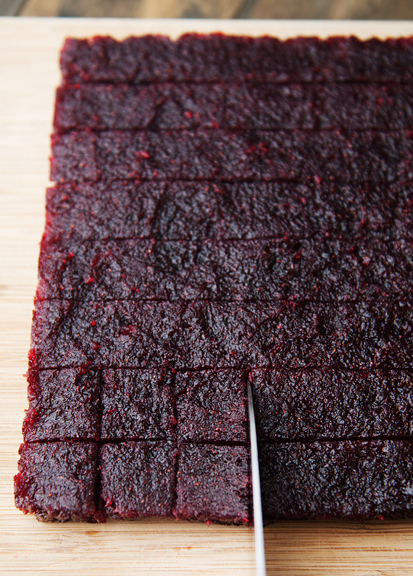 Make the pate de fruit: Line an 8×8-inch square pan with parchment paper. 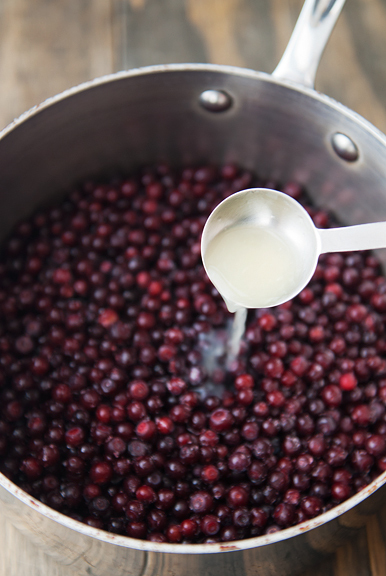 In a medium saucepan, heat the huckleberries and 2 tablespoons of lemon juice over medium-high heat for about 5 minutes. 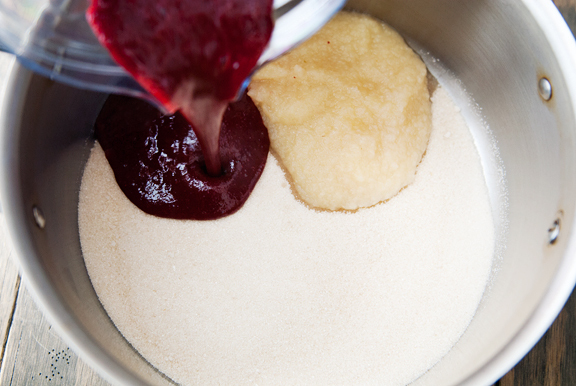 Pour the mixture into a blender and purée until smooth. 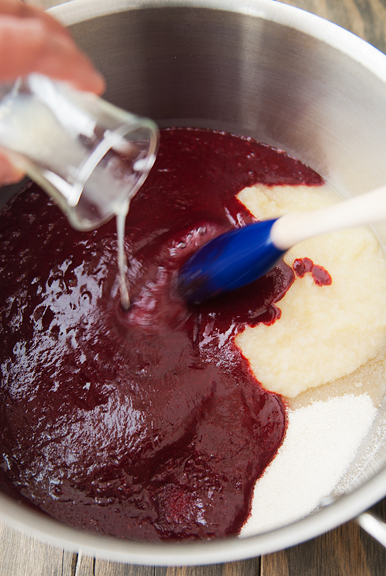 Return the huckleberry purée to the same saucepan with the sugar, applesauce, and remaining lemon juice. Cook over low heat, stirring until the sugar dissolves. Turn the heat up to medium and attach a candy thermometer on the side of the pan. Bring the mixture to 230°F for sea level (213°F at 8500 feet elevation – subtract one degree from 230°F for every 500 feet above sea level). Let boil at target temperature for 2 minutes. Stir in the pectin and boil for 1 minute. 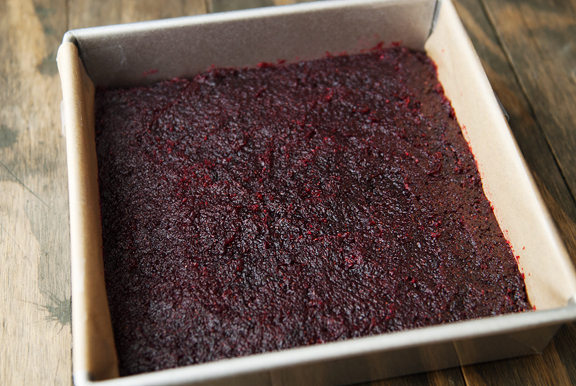 Pour the mixture into the square pan and smooth the top as best you can. Let the candy cool until set (about an hour). Turn the candy out onto a cutting board and cut the sheet into 1-inch pieces with a knife or use small cutters (like cookie cutters, but tiny). 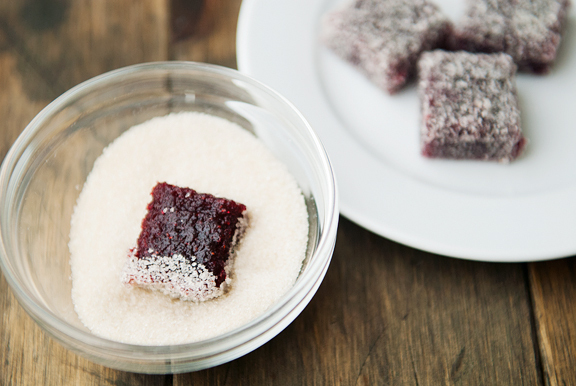 Roll each piece in granulated sugar. 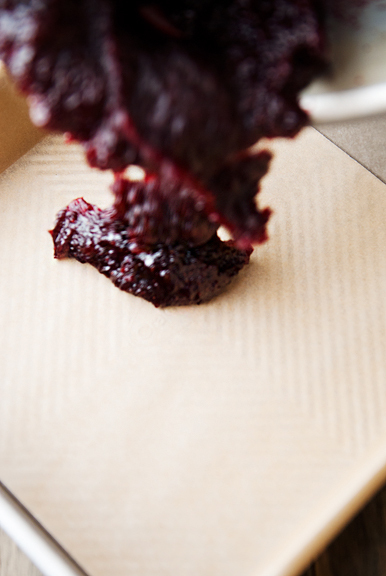 If enrobing the pate de fruit in chocolate: Line a baking sheet with parchment paper, wax paper, or a silpat sheet. 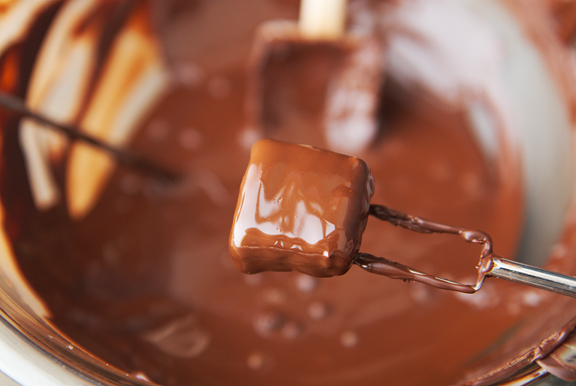 Melt the chocolate – method 1: You can melt the chocolate gently over a water bath by placing the chocolate in a double boiler or by putting them in a large heatproof bowl over a pan of simmering water (about 2 inches deep). Make sure the bowl is wider than the pan because you don’t want water getting into the chocolate. Stir until the chocolate has melted completely. Turn off the heat, but leave the bowl over the water bath. 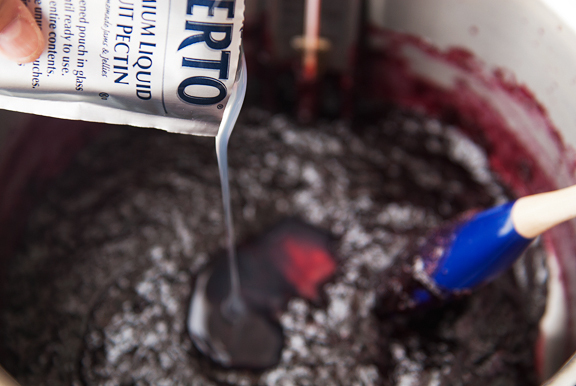 If the chocolate gets too cold (too thick), you can heat the water bath again until the chocolate loosens up. Temper the dark chocolate* – method 2: For the seed method of tempering, place all but 10 chocolate chips or chocolate pieces in the top of a double boiler or in a large heatproof bowl over a pan of simmering water (about 2 inches deep). Make sure the bowl is wider than the pan because you don’t want water getting into the chocolate or all of it will seize. Stir until the chocolate has melted completely, monitoring the temperature of the chocolate. When it reaches 112°F, remove the bowl from the water bath (it will continue to rise – that’s fine because we are targeting a final temperature of 118-120°F, just don’t get to 180°F or it will burn) and set it on an ice pack or a larger bowl of ice to start cooling it. 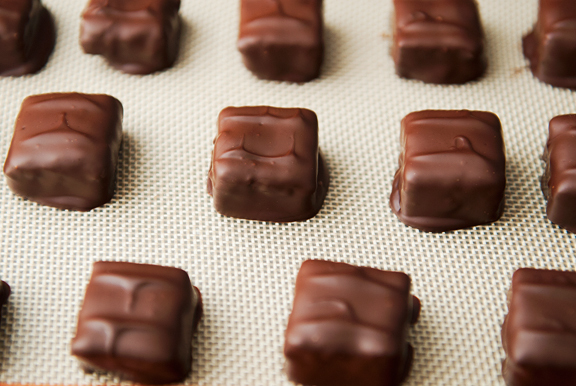 Stir the chocolate constantly to promote proper crystal formation (for tempering). Continue to monitor the temperature. When the chocolate reaches 95°F, toss in the chocolate chips. This is called seeding and should encourage the formation of good crystals for tempering. Keep stirring. The chocolate is in temper between 88-91°F at which point you can remove the bowl from the ice. Stir often between dippings and when the temperature drops to 88°F, set the bowl on top of the warm water bath (if it’s too warm, place a kitchen towel over the pan and under the bowl). Monitor the temperature as it rises. When it reaches 91°F, take it off the pan. * This method is for dark chocolate. Milk and white chocolates should target a high temperature of 116-118°F, seeding at 95°F and perhaps again at 90°F, and they are in temper between 85 and 87°F. Also, you have to use high quality white chocolate – any white chocolate that uses palm kernel oil or coconut oil won’t temper (it will separate and be unusable). 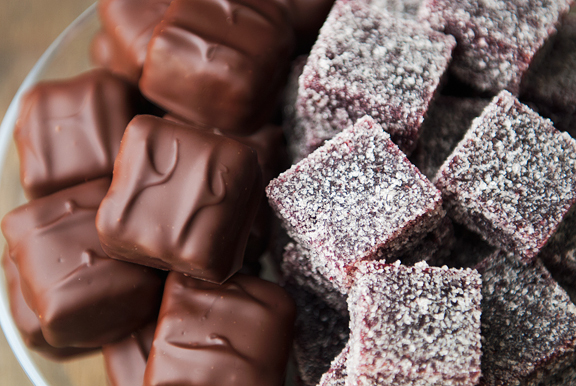 Dip the pate de fruit (both methods): Drop a square of pate de fruit into the tempered chocolate. Use a fork or an enrobing fork to flip it over so the entire candy is coated in chocolate. 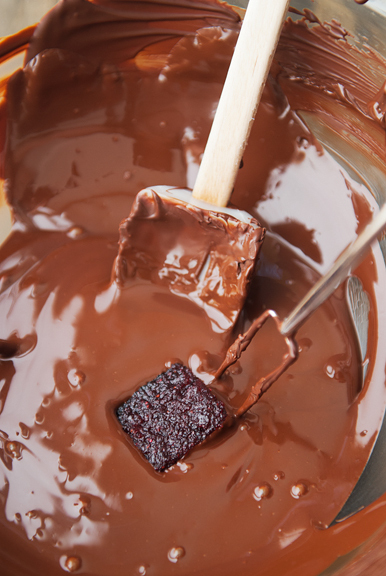 Scoot the tines of the fork under the candy and lift it out of the chocolate. Shake off any excess chocolate by gently tapping the fork on the edge of the bowl, then gently scrape excess chocolate off the base on the edge of the bowl. Set the candy on the baking sheet. If you are a seasoned enrober, go ahead and touch the fork tines on the top of the wet chocolate (don’t do this when it’s nearly dry or it will look terrible) or make whatever pattern you like on the chocolate. Repeat for the rest of the candies. Let the chocolate set. thanks for sharing the indivisible guide; i was feeling a bit cynical when it comes to contacting my reps, particularly because i am in a heavily one-sided district and felt like my opinion wouldn’t have weight. will renew my efforts. I purchased some pâte du fruit during a trip to France and I loved it! I’ve been wanting to try to make some myself so this is wonderful. Thank you! We alshould dishoveled Lokumi in Greece. Very similar, but covered in a powdered sugar. Mmmm. I hope you are feeling better! Indivisible has been a helpful guide for me as well. I also heard last week that we should be calling our senators and representatives at both their local and DC offices. I haven’t yet put the local office into my phone but, as I am calling about immigration today, I need to get on that. These organizations are all on my list as well. Thank you for sharing. Thank you for being political in your posts even though you prefer not to be normally. The times are such that I believe we just cannot afford non-political spaces anymore. I actually quit reading some foodblogs that did not mention anything about the election and the political landslide that we had to observe. The people directly and personally affected by Trump’s politics do not have the time and luxury to avoid politics and so we shouldn’t have that either. As a German born in the 1980s, I often asked the question to old people: why didn’t you do anything in the 1930s? And we will also have to answer that question by future generations. I get that food blogs can’t turn into political blogs all of a sudden, but mentioning organizations like you did, that we surely can! Happy New Year to you, your family & your friends! Thank you for both the recipe and your action guide! Very helpful for those of us also trying to sift through all the important issues (and they’re all important) to find a few to focus efforts on and not become overwhelmed. Have a great one! Yeah, thanks for being real and not pretending all is well. We’re all immigrants and only love and respect will move us forward on this planet. I’ve actually shed a few tears this past weekend out of sheer frustration. And for the first time I e-mailed my senators, and made a donation to ACLU in Trump’s name. 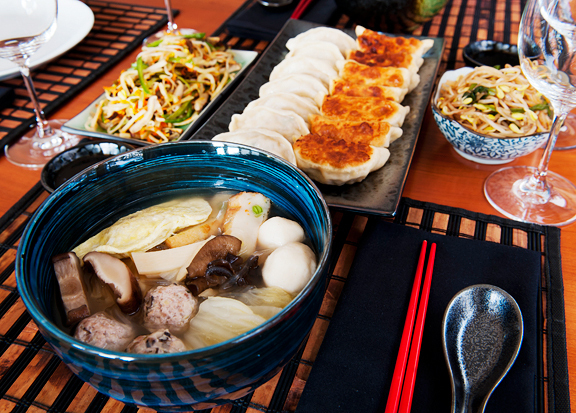 Hope you’re feeling better, this recipe looks ahhhmazing. 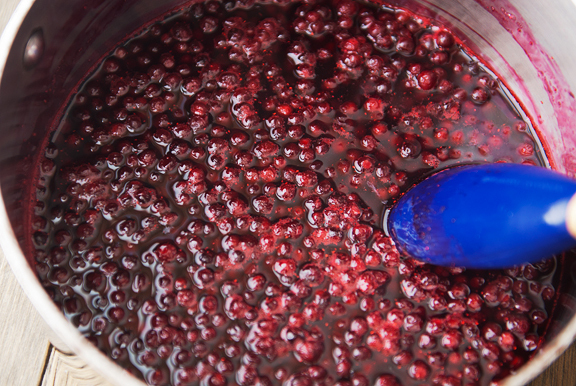 I used up my last jar of highly coveted homemade huckleberry jam for the holidays. :( Guess that means I’ll have to make another trip out west! Thank you my friend for your beautiful blog. Your photos are spectacular. Your passions are real. And I am grateful for your perspective. I have been an avid reader of your blog now for many years and have always found much to enjoy on it. With that in mind, I hope you will be assured that my comments here are offered sincerely and in earnest, not in sarcasm or vitriol. 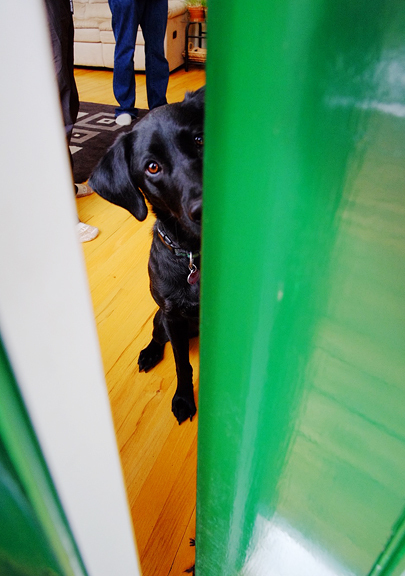 In departing from your usual “nonpolitical” subject matter, you signal that the recent election has not been simply disappointing for you, but has indeed caused tremendous personal concern and dismay. Jen, please know that that is how 60 million of us have felt for the last 8 years. It has been a torture. And, believe it or not, many of us discuss these issues with those we care about, “reasonable, level-headed, critical thinkers”. Why do I quote you? Because there is an air and attitude that inevitably accompanies comments by those who are troubled by our new president, that those of us who don’t see things with a liberal view, are somehow not “reasonable, level-headed, critical thinkers”. Now that we all realize that every one of us, blogger and readers alike, don’t just “feel very strongly” about the recent election but think critically about it as well, and are equally terrified and dismayed about many aspects of the political/cultural sphere, perhaps we can focus more on what seems to bind everyone together here, which is the love of food and the artful presentation of it; the wonder that is our great natural world; Jen’s fabulous snow and ski-filled life; and that silly, black, joyful, tail-wagger. It’s definitely not a moment to stay silent about the politics and I for one love your blog even more now. I hope you are feeling totally healthy now. Happy (belated) New Year! Kristin – Good on ya, sistah. Michelle – You are welcome, and thank you. CHRISTINE – Mine is not just a food blog. It is my personal blog. And yes, YOU can just read about the food! I have a link at the top of each recipe post that – if clicked – will jump down to the recipe at the bottom. This way you can avoid reading anything that might upset you (unless recipes upset you, then you’re kinda out of luck). If that doesn’t work for you, then there are thousands upon thousands of food blogs out there that might fit your criteria. Best of luck to you. Mary – You are very kind. Thank you for reading. Amy – My “reasonable, level-headed, critical thinkers” span the spectrum from left to right. Please don’t impose your bias on my words. Your poorly presented arguments belie your claim that “every one of us… think critically.” As for the content of my blog, please refer to my answer to Christine’s comment. I wish you the best. Tanya – Thank you, I am feeling much better now. Happy New Year, to you!